This project investigates the Islamic sacrificial feast in the context of its changing socio-structural and economic conditions, especially focusing on the ritual slaughter of sacrificial animals. The meat of the slaughtered animals is either eaten collectively or given out to people in need. In the course of migration and urbanisation in Turkey, a transformation of local practices can be recognised. Particularly in Germany, a professionalisation of the sacrificial ritual can be noticed, e.g. in the form of cash transfers to Islamic aid agencies which perform the ritual slaughter abroad on behalf of the donor. The archived photos and films were taken during fieldwork in an Anatolian village near the Black Sea and during sacrificial feasts in Germany. Additionally, various offers of several aid agencies are documented. Surroundings of Heidelberg and the Turkish coast of the Black Sea. 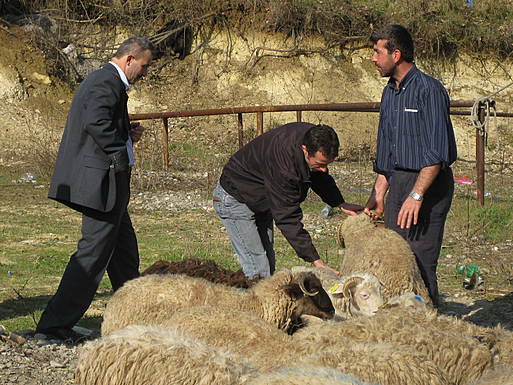 Trade of sacrificial animals at the day before the sacrificial feast in Turkey (photo: Paula Schrode, 2010). A sheep is prepared for the ritual slaughter on the Islamic sacrificial feast (kurban bayrami) in Turkey (photo: Paula Schrode, 2010).